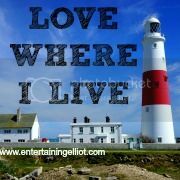 Thousands of tourists flock to Poole every Summer and a boat cruise around the harbour is on many of their to-do lists, especially for those visitors who aren't lucky enough to have the coast on their doorstep! For locals such as myself, it's easy to take where we live for granted but I really wanted to take a boat trip to show Elliot some of the sights of Dorset that he's only seen from afar. 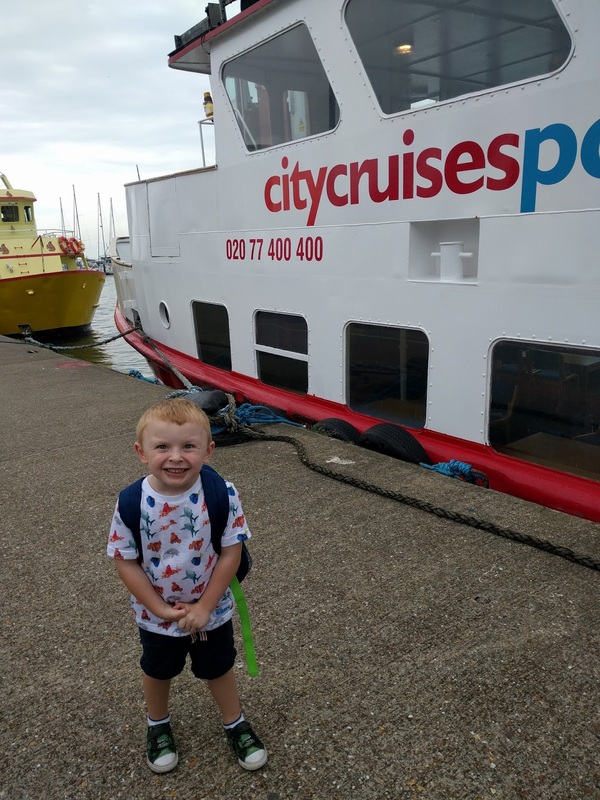 There are various different companies who offer boat trips from Poole Quay but I decided to book a Jurassic Coastal Cruise with City Cruises. This is a 2 hour (approx) return trip which costs £10.35 for adults and £5.18 for children (5-16 years) when booked online. Despite the scorching sunshine of the day before, it was really muggy and drizzly when we boarded the boat but this didn't bother us - we decided to sit up on the top deck and we had it to ourselves as the other passengers didn't fancy getting wet! Enjoying the lovely British weather! Our boat departed from Poole Quay and made it's way past the Sunseeker boats being built at the shipyard, past the ferry terminal, and out towards Brownsea Island. Despite the weather, the sea was relatively calm and soon we were heading out of the harbour and past the golden sands of Studland Beach. It was such a pity the weather was so miserable as usually you can see for miles all the way across to the Isle of Wight but I struggled to see Bournemouth in the distance! We cruised along the coastline taking in the beautiful views of Old Harry Rocks (said to be named after infamous Poole pirate Harry Paye) - these mark the most easterly point of the Jurassic Coastline. Sometimes dolphins can be spotted in these waters but sadly we didn't see any today! We jumped back onto the boat and ironically as we departed from Swanage, the sun decided to come out! 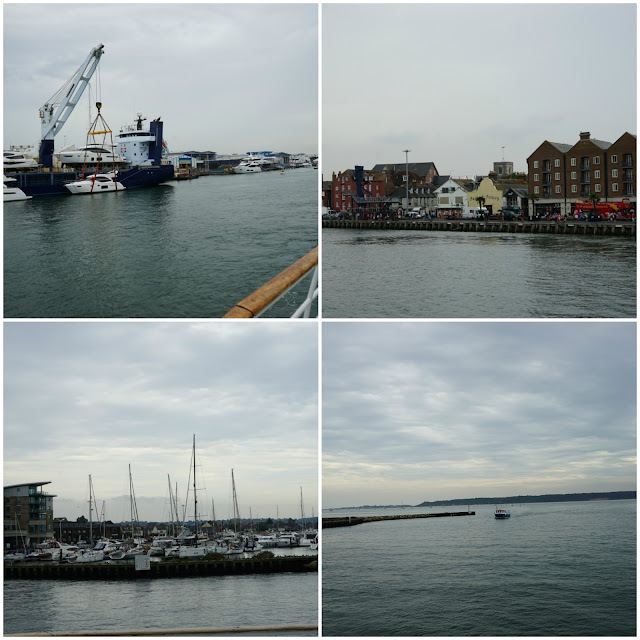 It meant we could sit upstairs on the top deck again and the views across to Poole were stunning and certainly a lot clearer than our earlier journey. 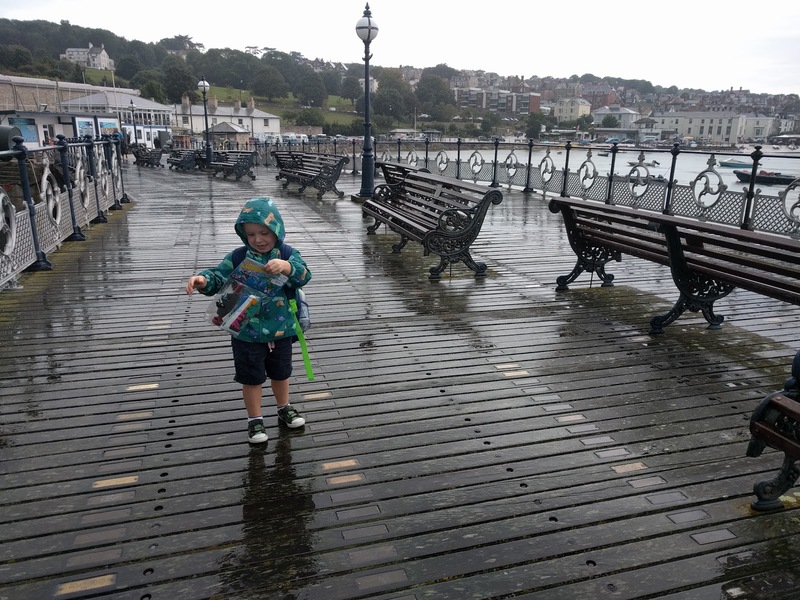 We had a lovely time on the Jurassic Coastal Cruise despite the weather and would thoroughly recommend it! I really like the look of the rock formations Old Harry, and the sea was certainly very calm and flat. Glad the sun shone, in the end, to dry you out a bit! There's lots to be said for doing touristy things in your home town, and I think having kids pushes you into doing them a bit more. Thanks for linking to #daysoutwithatoddler! See you next month!